The library has a collection of about half a million volumes, relating mainly to arts and music. In addition to books and periodicals, the collection also holds a large number of music scores and audio-visual materials. Among the library holdings are valuable source materials concerning the introduction of Western music to Japan in the late nineteenth century. This collection is used by a number of outside scholars. Search facilities have been computerized. 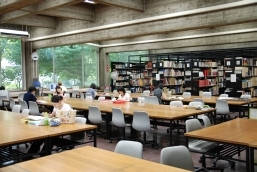 The library also offers on-line access to other research facilities. In addition to the lending and reference service, the library offers inter-library loans.